Renovating your home can be expensive and time consuming—but the good news is that there are other, less expensive ways to create a fresh and exciting new ambiance in your home. 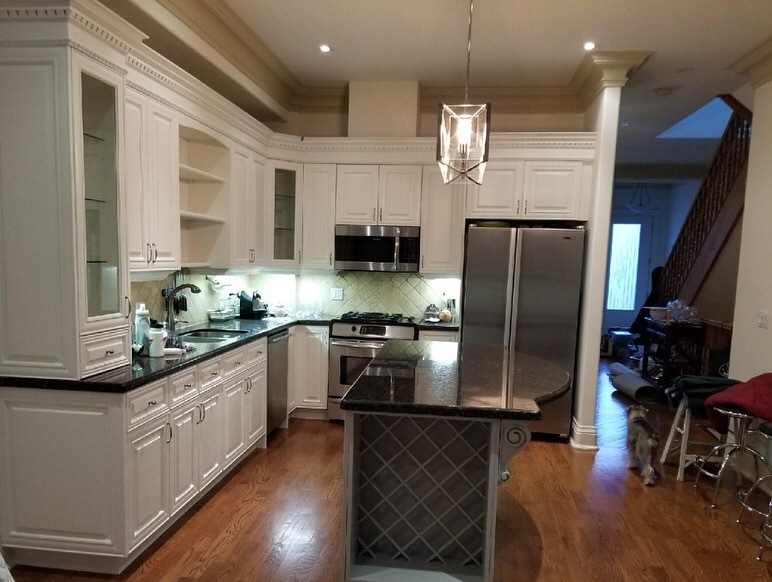 If you’re looking to bring some much-needed life into your existing kitchen, bathroom or living spaces, custom cabinet changes can upgrade your Toronto home in ways you may have never expected. Custom cabinet changes are a terrific way to upgrade the look of your home without breaking the bank, and the best part is that you prevent perfectly good cabinetry from going to waste sites. Here’s what you need to know about Booth7’s custom cabinetry services in Toronto. Door and cabinet trims don’t have to be simple and boring. We provide custom cabinet and door trim services to our clients to help them get a handcrafted, incomparable look that is their very own. Trim work is a great way to transform the look of your home and add some flair that will get noticed each time you or your family members walk through the doorway or open a cabinet. Your kitchen will never look the same again! Our custom trims can be designed to enhance the pre-existing look of your home or complement new décor. Also known as cornice moulding, crown moulding adds a special touch of style and charm to any room in your home. Our beautiful designs look like works of art that line your ceiling to look elegant and refined. Until recent developments in technology and materials, these installations were expensive and challenging. Thankfully, we no longer use plaster as our only option. We also use stable medium-density fibreboard (MDF) to transform the look of your home and provide a quick, hassle-free installation, with an easy cleanup. Display cabinets are the perfect way to safely show off your treasured China dishes, sculptures, photographs, and other precious items. We create glass door cabinets for design and convenience, so no matter what room you have them installed, they will enhance the beauty and elegance of your home. Valances are a beautiful accessory to add a hint of detail to your cabinetry arrangement or furniture design. They also provide functional benefits by connecting cabinets to the left and right above a sink. With our unique valance designs, you can upgrade the top of your book shelf, hutch, entertainment unit, window trim, or range hood above your stove so that your room has a striking, cohesive look. Feel like your home looks like everyone else’s but you want to stand out? We can help by upgrading your existing gable panels or corbels for a refreshing, new look. The gable is the perfect stage for all kinds of custom trims, so you can create the custom look you want with ease. If you want better storage and display of your growing collection of wine bottles or simply want to display your modest collection, we can design custom wine racks that give just the right look. We have a variety of solutions including table-top, free standing, round, square, tall short, and hanging. It’s frustrating to treat family and friends to a home-cooked meal and feel cramped in a small kitchen. If you need more space to cook, serve, or store food in your kitchen, we can help! Based on your existing kitchen design, we can create additional island space, pantries, and serving areas for you to better entertain your guests. When upgrading your kitchen cabinets, it’s important to consider all the pieces that make up the design of the room. Cabinets and countertops are easy to remember, but don’t forget the toe plates down below. These convenient pieces can also be upgraded to match your cabinets or floors and accentuate the look of your kitchen. If your bathroom needs an upgrade but you’re on a budget, begin with vanity light trim. This service allows you to brighten your bathroom and transform the look of old light trims with new, modern ones. Or, if you want a more rustic or vintage look, we can create light trims that take you back in time. Hardware replacements and upgrades like soft-closing hinges can protect your new, upgraded cabinets and drawers. In fact, our soft-closing hinges are a great idea to consider if you have a large family full of kids. This creative feature allows your drawers and cabinets to slowly close, so they will never be slammed shut. It protects the little fingers of your kids from getting hurt; improves the longevity of your investment; keeps the items in your draws from shifting too much; and prevents loud, disturbing slamming sounds. No detail is too small! We can also provide door hardware such as knobs, drawer slides, hinges, back plates, pulls, and more to help you get the design and functionality that is customized to your needs. If you’re looking to give your home a fantastic upgrade without the high cost associated with a full-scale renovation, we have many services that can help you! At Booth7, we are a one-stop shop for all types of home upgrades, from custom cabinetry refinishing to interior painting and furniture restoration. Our professionals will handle all the details of your project from start to finish, so you can trust us to get the job done right!